This maybe a slightly quieter time for rowing competitions, but there are still many opportunities for getting out on the water and training in the gym to get ready for the Regatta season which starts next month. The North East Region held trials at Cambois Rowing Club on the River Wansbeck at Ashington last weekend. This is where the young rowers from across the region compete to see who is selected to represent the region (one of 12 in the UK) at the Junior Inter Regional Regatta, held in Peterborough at the end of April. The races were in the “Head” format, where rowers set off in succession with a rolling start against the clock rather than side by side. The course length was 1000m, the same as Peterborough, but somewhat more twisty than the purpose built, 4-lane lake they’ll be on next month. 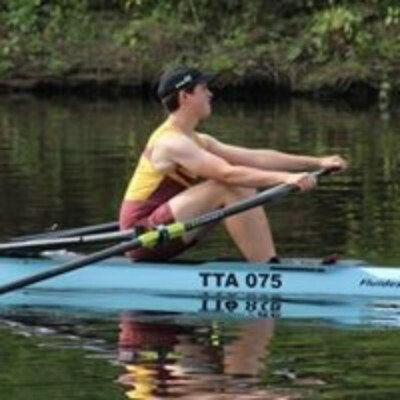 Ben Norman won in his J16 single by 3 seconds, and therefore has been selected to represent the region at the National competition. 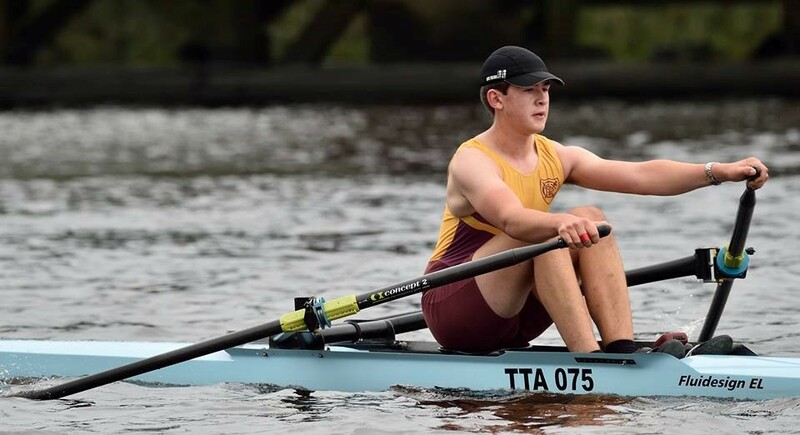 He then teamed up with 3 other rowers from Durham Schools club and they cam second in a J16 Quad sculls race – which still has a chance of going forward. Esther Rowntree came second in the women’s J16 single; Dylan Rees and Sam Britton enjoyed their row and came 5th in the J15 double sculls. On the same day, several crews from Talkin Tarn travelled over to York for the Yorkshire Head. This is a 5000m course downstream on the River Ouse, starting twisty then opening out with a last blast to finish just by Lendal Bridge; and is the last “head” race in the region before the shorter Regatta start. Ian Machin, Keven Wilson, Denis Burke and John Lewis were coxed by Tom Lewis and had a good race in their Four, but Jo Lewis won her women’s Masters D single scull by a clear margin. 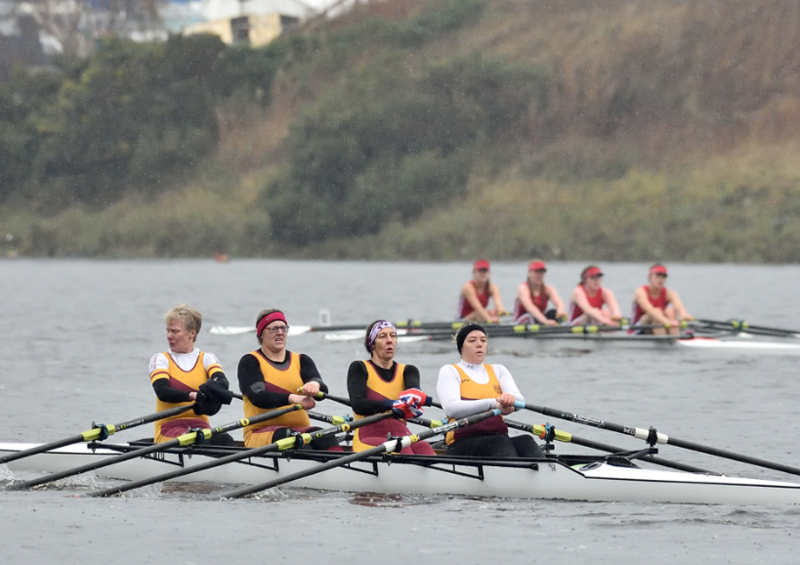 Jo then hopped in with other ladies from Hexham and Berwick Clubs in a composite crew, and they then won the women’s Masters quad race together in the afternoon. Sunday was the first of the Northern Rowing “Sunday League” This series is aimed at recreational rowers, novices, recent graduates of learn to row courses and those returning to rowing after a break and is held over 8 rounds through to the Autumn. The first round was at Tyne Rowing Club, using stable coxed quad boats over a 300m course. Talkin Tarn Amateur Rowing Club put up two crews for this round, and all races managed to be run just before the arrival of Storm Freya! The crew named “Tarnished” comprised John Pattison, Simon Burd, Kevin Dixon, Malcolm Taylor, Susie Tyson, Neil Corrie – 4 rowing at any one time and coxed by the very experienced Peter Thompson. They normally enjoy the Tarn together on Thursday afternoons, and were pleased to have one win at Tyne out of 4 races. Also competing was “Fast Talkin” crew of Alison Clarricoats, Simon Smith, Louise Smith, Miriam Macfarland coxed by Gill Houston. They normally row together on a Sunday morning, but skipped training to compete and win a race and come home very close in another. Talkin Tarn Rowing Club – that’s it for 2018! Last weekend saw the last formal competition for rowers from Talkin Tarn, with an all too familiar cold, wet and windy trip up the River Tyne. The Rutherford Head is held upstream and against a falling tide on the River Tyne from just below the A1 bridge back up to Newburn. With an entry of 130 boats in each Division, many University crews having a last race before Christmas, it is a very busy event. The downside is that after warming up rowing down to the start, crews must wait around getting cold and wet for up to an hour whilst all the other crews get to the start – teeth could be heard chattering over the roar of trucks on the A1! Talkin Tarn had several crews taking part, no outright wins this time, but some notable “podiums”. The Women’s coxless quad crew of Hannah Rigby, Linda Watson, Katie Robinson and Gill Houston had their last race as “Seniors” – as the crew becomes “Masters” from January, but they left the age category with a fine 3rd in the category, losing against the local Durham and Newcastle University crews. The Masters coxless quad crew of Dudley Smith, Dave Harte, Alan Cook and Jon Britton had a cracking race, and came second by just 2.5 seconds behind their Hexham rivals, which pleased them and worried Hexham… The Masters coxed four crew of Ian Machin, Peter Pearson, Denis Burke and John Lewis, coxed by Tom Lewis also had a second in their category losing to a crew who travelled over from Belfast during Storm Diana, to enjoy the very soggy conditions in Newcastle. A couple of weeks before, there was a small entry from Talkin Tarn at the York Small Boats Head race, but the Club had a 100% success rate! This is one of the most scenic courses in the North, a wide but gently meandering route upstream along the River Ouse from Fulford, up past the Bishop’s Palace and right through the centre of York to the finish 3,000m later. The river can suffer from high flows and flooding, but on this occasion the weather was perfect and the river was benign for Tarn rowers Ben Norman and Jo Lewis. Jo enjoyed the conditions back in the County of her birth, and was very pleased to be the fastest of 10 competitors, to win the Women’s Masters single sculls category. Ben Norman won the J16 single sculls (against 7 rivals), then hopped into a Durham Schools composite crew in the J16 coxless quad to win against their nearby rivals Yarm School and the local York City crew (and four others). 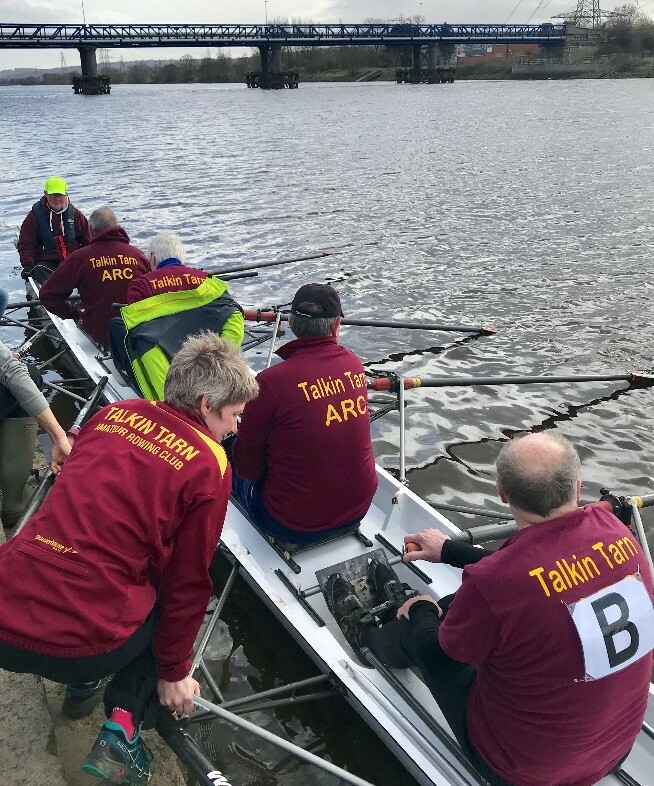 Talkin Tarn Amateur Rowing Club has entered the Northern Rowing Council Long Distance Sculls series of races for many years. This is six races held on various rivers in the North East over consecutive weekends in October & November. To thank competitors for their considerable commitment (and facility to dry rowing kit between events…) the big prize is the Victor Ludorum Silver Plate, given to the Club with the most points accrued over the whole series. Talkin Tarn has found it hard to succeed in winning any of these in the past, as we are a small club in terms of numbers, and all the races are the other side of the country! But in 2018, Tarn was overjoyed to win the Victor Ludorum plate for the Senior Category (the age group between Junior and Masters). 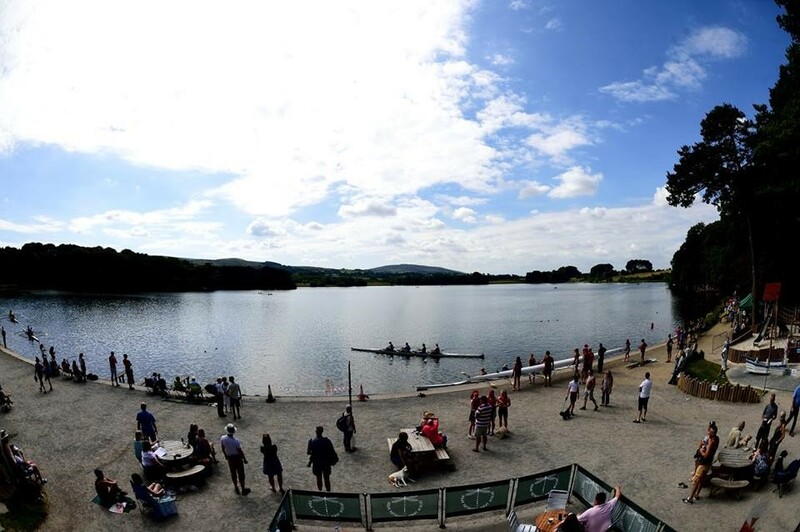 Talkin Tarn Rowing Club – head East for better weather! The season of “Head” races is carrying on, and rowers from Talkin Tarn rowing club have been actively competing over in the North East for the last couple of weekends. City of Sunderland Rowing Club hosted the South Hylton 4750m long distance sculling race on the lower reaches of the River Wear. This is an event notorious for challenging conditions, and last weekend was no exception! There was a brisk South West wind which made it hard work getting to the start, but quite quick racing on the way back down the river. However, part of the course was very rough where the wind was against tide, but only a small number people went for a swim, one only a metre off the steps (but he landed, changed, got back in and raced anyway!). The Women’s coxless quad crew of Hannah Rigby, Linda Watson, Gill Houston & Katie Robinson (as in photo below), being experienced in windy conditions on the Tarn, had a cracking race and finished fastest Women’s crew overall, and 6th fastest boat of the whole event. Last weekend a large number of Tarn rowers accompanied two full trailers of boats across to Durham, where three runs were possible on the 1800m course upstream on the higher reaches of the River Wear. This course is sheltered and relatively calm, but those steering boats are challenged by the narrow arches of the medieval Elvet Bridge that crosses the river at an awkward angle a third of the way down the course. 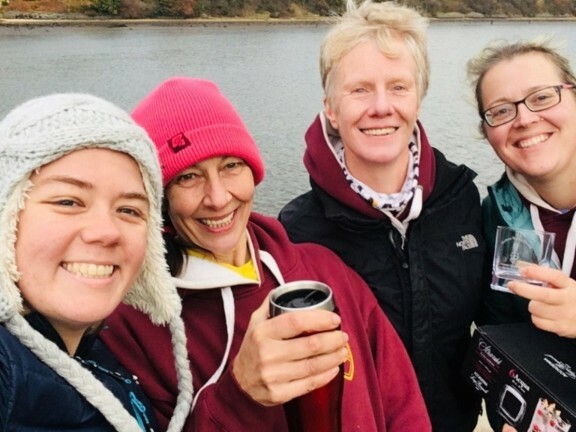 In the morning event, the same Women’s coxless quad crew that showed such success the previous weekend had a clean race and again won their category, bringing home more engraved glassware. Just half a second ahead of them James Smith, who had learnt to row at Talkin Tarn and has recently joined Durham University Boat Club, drew on his excellent training to win the Open Single Scull category. Only 4 boats behind the ladies, Ben Norman won his J16 single scull event. The Masters coxless quad crew of Ian Machin, Keven Wilson, Dennis Burke and John Lewis were fastest boat in their category, but without the required 2 opposing boats, they still had to drink out of paper cups. In the afternoon two Head races (whose results confusingly were combined into one event), Ben Norman won the J16 double sculls with a partner from Durham Schools Club, then in order to give his Mum more washing up, went in with three others from the same club to win the J18 coxless quad category with the overall fastest time of the whole afternoon. 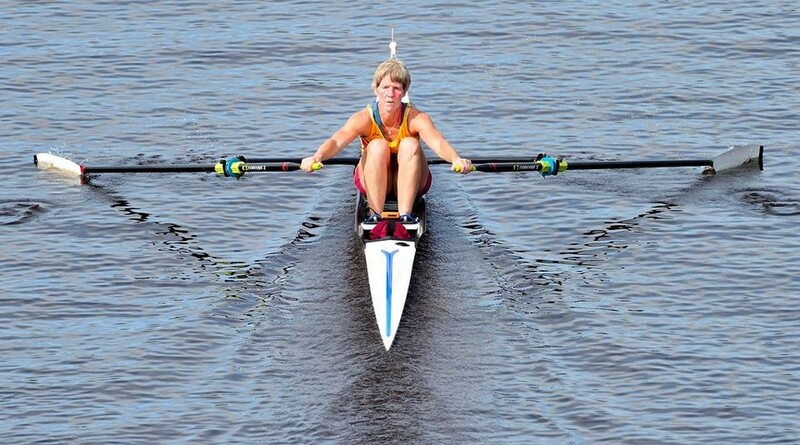 Jo Lewis continued her winning streak, winning the Women’s Masters single scull pot. The Masters coxless quad crew of Dudley Smith, Alan Cook, Jon Britton and Dave Harte came a superb 6th fastest overall, but like their clubmates in the morning, came away “potless” due to lack of enough opposition. 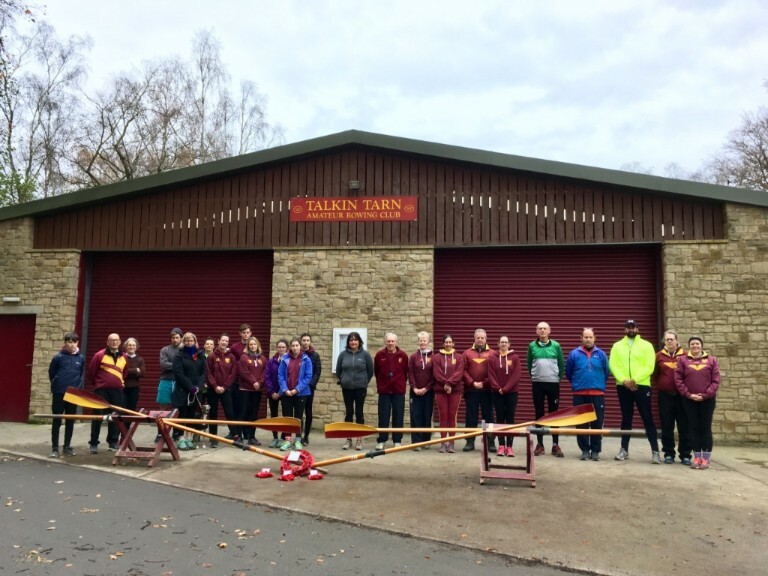 On Sunday, members of Talkin Tarn Amateur Rowing Club held their own 2 minutes silence at 11:00 in Remembrance, thinking especially of three young club members who we believe lost their lives. William Bell of Farlam Hall Cottage, Joseph Harding Jnr of Moat Street Brampton, and John Hogg of Forest Head, were all noted in the Club registers before the First World War, but sadly didn’t return from the trenches. Now the nice short races of the “Regatta Season” in spring & summer are well and truly over, rowers from Talkin Tarn Amateur Rowing Club have been competing almost every weekend. The normal competing region means travel across the A69 to the North East, but a couple of rowers from Tarn branched out and competed in the Runcorn Rowing Club Small Boat Head race earlier in the month. This is held on a quiet stretch of 4,500m of calm water on the River Weaver Navigation near Frodsham, clearly visible from the M56 flyover if travelling to North Wales. Jo Lewis and Ben Norman made the trek, but it was worthwhile. Ben won the J16 single sculls category, and Jo won the women’s Masters single sculls. The next Saturday saw several crews from Tarn competing in the Tyne United Rowing Club small boats Head race, a 4,500m race upstream from beyond the A1 flyover up to Newburn. The weather was kind for a change, as this stretch has a reputation for cold, wind and rain! Competitors who are keen, can compete the course twice in two separate races. The entry is huge, with over 130 boats competing in each race. In the morning, 8 crews from Tarn were racing, and wins were achieved by Jo Lewis in the women’s Masters single sculls and Dylan Rees with Sam Britton in the J15 double sculls. Later on, four Tarn crews were out on the water, with some strong performances but the only prize winner being Ben Norman, winning the J16 double sculls in a Durham Schools composite crew. Berwick Amateur Rowing Club hosted the “furthest North Head race in England” last Saturday. This is described as a “long” 5000m course on the River Tweed, and it certainly felt all of that. Not an event regularly attended by crews from the Tarn, as it’s quite a long and twisty route to tow a trailer with 40’ boats on, but on this occasion the nice weather and conditions made it very worthwhile. Boats are launched in the middle of town, then crews row upstream under the East Coast Mainline railway bridge, and the A1 bridge into lovely rolling fields at East Ord, passing many old salmon netting stations, and having to wait for the tide to lift the boats high enough to get over an ancient ford. It’s the only time we’ve competed with seals popping heads out of the river to spectate! It was a good event for Talkin Tarn, with 3 of the 4 fastest crews on the event. 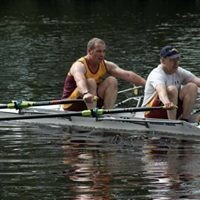 Dave Harte, partnered with Kevin Oates from Hexham, was the fastest overall, winning the Masters double sculls prize; then just 2.3 seconds behind them was the Masters quad crew of Alan Cook, Matt Grainger, Julius Deane and Jon Britton. Then 3.5 seconds after them, as fourth fastest on the day, was Tarn’s Ben Norman, this time competing in a J18 double sculls composite crew with a rower from Durham Schools. Tarn’s Jo Lewis then continued the success being the fastest Women’s Masters single sculler. Celebratory cakes were well deserved! Talkin Tarn Amateur Rowing Club also holds competitions for its own members at this time of year. One of these is the “Sue Lawson Trophy”. This is a race for 750m across the Tarn for scratch doubles crews, usually of differing ages and experience! The poor winners have had to win four consecutive races. The winners this year was the crew of Dave Harte and Emelia Sefton, pictured below receiving the trophy from race sponsor Chris Lawson. Saturday 1st September saw rowers from Talkin Tarn compete in the second running of the Newcastle University Boat Club “Tyne Scullers Head”. This is a race only for single scullers, held over nice conditions over a 3000m course from Blaydon upstream to Newburn. The course starts with a couple of long sweeping bends with mudbanks to look out for, then the last half of the race is a straight – that must feel a lonely and long way for any rower in a boat on their own. Tarn’s Ben Norman started things off well for the Club, by not only winning the J17 age category, but winning the whole 1st Division, leading the way home ahead of 33 other competitors. Jo Lewis completed the medals by winning her Masters C/D age category and being the fastest woman in the 2nd Division. 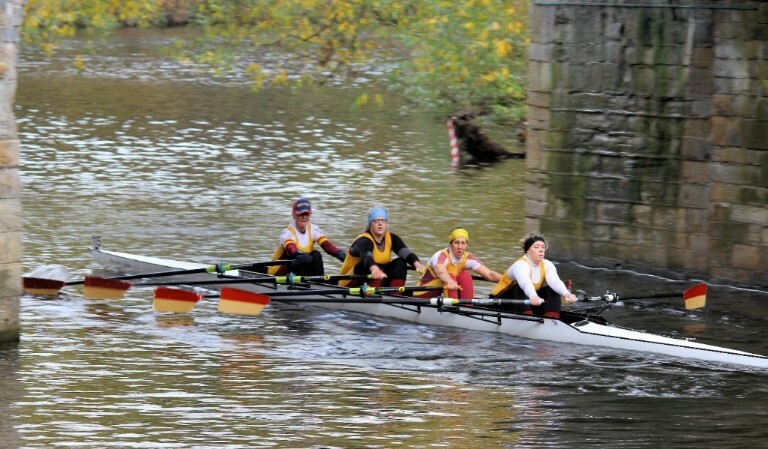 Last weekend rowers again left Talkin Tarn and headed over to the North East for the Chester le Street Autumn Regatta. 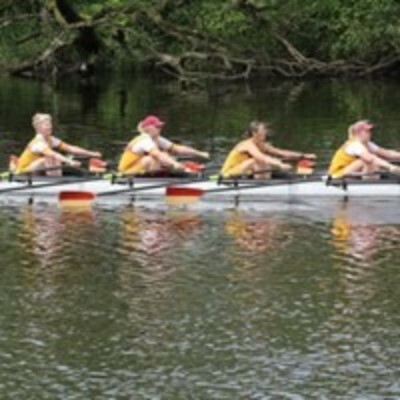 This event replaced their original Regatta planned for April, but postponed due to flood conditions on the River Wear – a problem we don’t have on the Tarn! This was a relatively short sprint course of just under 500m, but with a few deceptive bends and trees spreading out into the river to catch the unwary. Ben Norman was again in his J16 single scull, strongly won his quarter and semi finals but lost out in the final to a home-club rower by just 2 feet. The Masters quadruple sculls crew of Dudley Smith, Julius Deane, Matt Grainger and Alan Cook had their first win together against our neighbouring club, Nithsdale from Dumfries. Alan Cook and Julius Deane then came up against Dudley Smith with coach Jon Britton in the finals of the Masters double sculls, and after a close race won by 3 lengths. A few weeks break from competition now, before the winter season starts in earnest, with virtually weekly races up until mid-December. For Talkin Tarn Amateur Rowing Club, last Saturday was the biggest day of the year, when it holds the annual Regatta. The Club hold records of a Regatta at the Tarn in 1849, and this pre-dates the formation of the Club ten years later. For 2018, the weather was exceptionally kind, with just a breath of crosswind in the afternoon, but gloriously dry and sunny conditions through the whole event. Many visiting crews thought that we always had this sort of weather in Cumbria! It was a large and well attended event, with 378 crews from 26 different rowing clubs from all over the UK competing in 83 different categories, requiring 215 different races. For this substantial number of competitors, the event needs a huge number of local volunteers, and so all members, friends and family were pressed in to help staff everything from car parking through race control to commentary. The dry weather over the last several weeks meant that the water level of the Tarn was down about 8-10” below normal, which expose sand, gravel and rocks around the edges. This meant great care was needed on the landing stages, but also at the finish. One massive battle between three eights from Tyne and Durham clubs led to a storming finish, with all three running aground a few seconds after the horn was blown – luckily in soft sand! The race course is three un-buoyed lanes with a standing start from “stake boats” – where the stern is held by a helper until the Umpire shouts “go”. The crews then get the boats moving with a squeezing “draw” stroke or two, then some very short and fast strokes to accelerate, before calming down a little and settling in to a nice strong race pace diagonally across the Tarn to the finish 750m later along from the Café. Despite the frenetic nature of running an event of this scale, it all ran pretty smoothly and almost to time, which was a credit to the organisers and volunteers. Because all Talkin Tarn crews were needed for so many prolonged staffing duties, calm pre-race preparation was probably less than ideal; so home wins were maybe fewer than hoped for. That being said, many had good races and we had plenty of Silvers! For the Tarn juniors, Ben Norman was successful through his semi-finals to win the final of the J15 single scull race – nice to get a home win after several successes in this category during the season. He then teamed up with Jack Pattison (following the blades of his Grandad John who also rows at the Tarn) who together had a fine win against stiff competition in the J16 double sculls. They were overjoyed to win engraved half-pint pots, but sadly will have to wait a couple of years to drink from them! 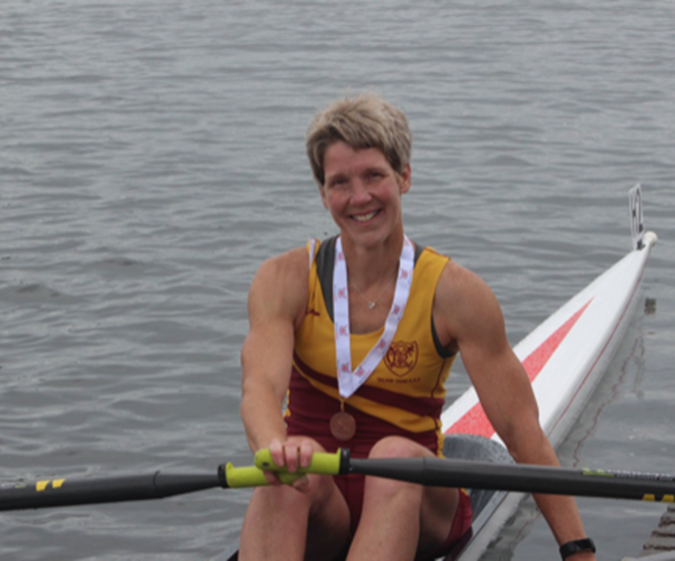 For the adults, Jo Lewis was against some very strong ladies from Lancaster and Loch Lomond, but with plenty of grit and determination won the Women’s Masters single sculls race. Sincere thanks go to all the visiting umpires, volunteers and helpers that made the Talkin Tarn Regatta 2018 such a success. 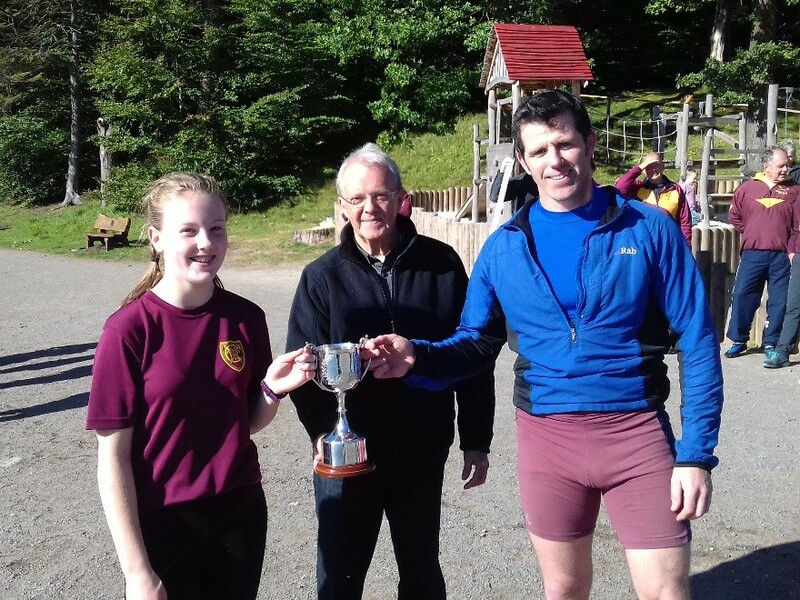 Last Saturday saw rowers from Talkin Tarn Amateur Rowing Club nip across the Border to our nearest Scottish event – the Nithsdale Regatta held in Dumfries. This is a small but friendly event, held on a deceptively windy and narrow 750m long, two lane course downstream along the River Nith. Talkin Tarn have always had a close relationship with Nithsdale Amateur Rowing Club due to the proximity, and it’s nice for some of us to be able to turn some hay in the morning, and race in the afternoon! Ben Norman continued his recent winning streak, as his brother (also learnt at Tarn) was competing for Liverpool University at the prestigious Marlow Regatta, Ben kept up the family tradition by winning medals in his single scull races – in both the J15 category which suits his age, then again beating older rowers in the J16 category. For the adult rowers, Hannah Rigby, Linda Watson, Katie Robinson and Gill Houston then took on younger crews and steered the longer boat well around the bends to win the “open age” Women’s coxless quad race against a local Nithsdale crew. 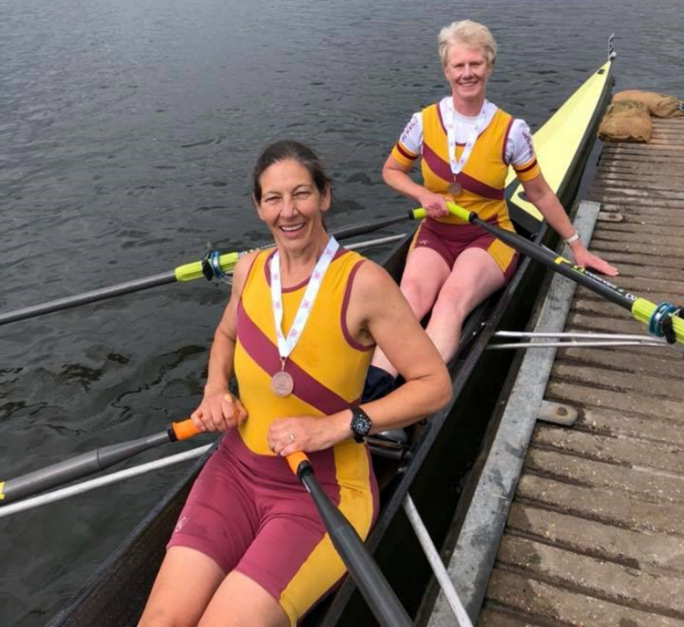 Then Linda & Gill, fresh from winning a Bronze in the British Rowing Masters recently, went on to win the Women’s Masters double sculls to add to the medals hanging off the bedstead. 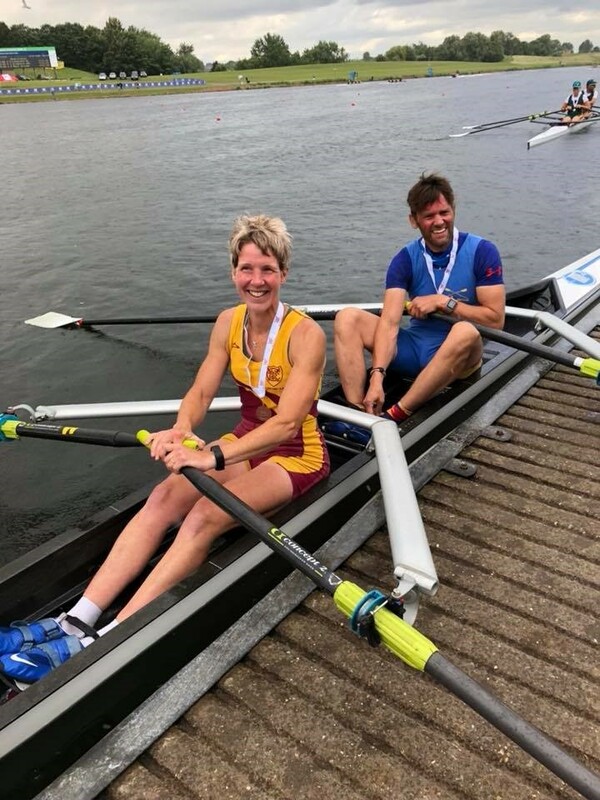 Jo Lewis, also having won a medal at the national Masters competition, then had a few tough races on the Nith, but pushed through to win the Women’s single scull competition. Not to be outdone, Alan Cook and Julius Deane, defending their medal from the same event last year, beat their own Coach racing in the semi-finals, and then went on to win the final in the Masters double sculls. A successful weekend for Talkin Tarn! Talkin Tarn – Rowing Report June 2018 – British Rowing Masters Championships. Last weekend was one of the biggest competitions of the year for the more senior rowers from Talkin Tarn Amateur Rowing Club – the British Rowing Masters Championships, held at the National Watersports Centre in Nottingham last weekend. “Masters” are those rowers over the age of 27, and these are then divided into age categories, “A” being the younger ones and “H” being the over 80’s! The course at Holme Pierrepoint is across 6 lanes along a 1000m straight flooded gravel pit, and the conditions over the weekend were characteristically very blowy and choppy, making starts difficult and going very heavy into the headwind. But this is the same for all competitors, and Tarn rowers are used to challenging conditions! But Jo found some hidden strength in the last 100m and pulled ahead to win the heat by just under 2 seconds. 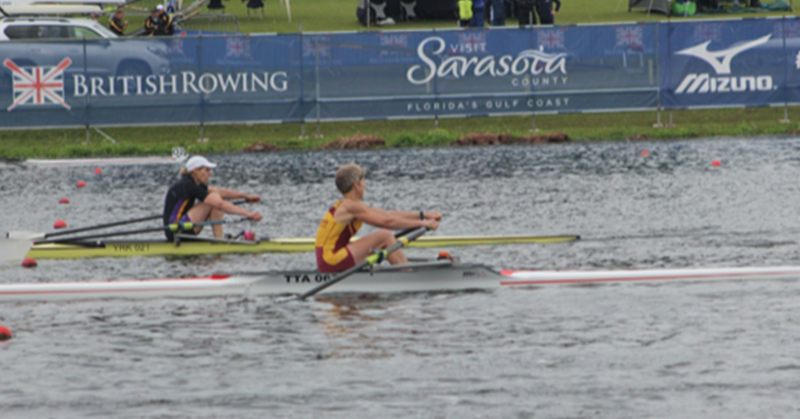 She was given only a short time to recover, then into the 6-boat final. Conditions were a bit choppier now, although luckily the forecast thunderstorms kept away. Jo rowed strongly through the race, and was delighted to win a Bronze medal, only half a second off the Silver! Later in the day, Jo teamed up with Hexham Rowing Club’s Kevin Oates. Despite having only been out in a boat together three times before, they had a strong race, winning Bronze medals by some 13 seconds ahead of the following boat. Also rowing for Talkin Tarn, Linda Watson and Gill Houston took part in the Women’s E double sculls. This was a heavily entered category, with some 16 boats taking part in the three heats. Gill & Linda knew that they had to win their heat of 5 boats to get to the Final but were in second place up to the last 100m, but with plenty of motivation from supporters on the Bank, they put on a spurt and came home first, 3 seconds ahead of Eton Excelsior. A short recovery time was allowed, then into the Final, which they knew would be close. Gusty conditions at the start didn’t help them get on their way, but digging into their reserves, they overhauled North Staffs, then Eton Excelsior (again), and then in the last stretch Kingston Rowing Club to gain well-earned Bronze medals by 3 seconds. Other Junior rowers at Talkin Tarn have had some success over recent weeks also. The National Schools Regatta, a big National event for school age rowers, was held a few weeks earlier at the 2012 Olympic course at Eton Dorney. Ben Norman from Talkin Tarn teamed up with other rowers from the North East to take part in the National Schools Regatta at the 2012 Olympic course at Eton Dorney. They came a creditable 6th in the J16 coxed quad sculls out of a field of 62! Dylan Rees had a good race at Cambois on the River Wansbeck and won the J14 single sculls, and Georgina Rowntree won the Women’s J17 single sculls at Hexham Regatta in a complete downpour. Ben Norman and Jack Pattinson also had success at Hexham and won their J16 double sculls races.